Walk into the gym these days and you’ll quickly notice they are filled with tons of training equipment. So much so that it can be almost overwhelming to know what to do when you’re there. Depending on who you talk to, each piece of equipment has a varying level of usefulness when it comes to building muscle and strength. Most people will advocate the use of free weight equipment like barbells and dumbbells. Some of these same people may poo poo the idea of using any kind of machines in training. However, there are some people that feel strongly that machines are still effective when it comes to building muscles. Just as with everything in life, the truth seems to lie in the middle. Both forms of training equipment can be used in an effective training program. Each type provides a different stimulus and dose response that will result in certain adaptations. So, it just depends on where you sit on the fitness spectrum and what kinds of goals you have when it comes to weight training. Because of their diverging outcomes it is best to know what to expect from the training modality that you choose to partake in. So let’s discuss the effects that each training style can have so you can make better decisions for yourself. When it comes to building high level strength, there really is no comparison. Free weight exercise will undoubtedly lead to more strength gains when you compare it to machine based exercise. This isn’t to say that you won’t build strength if you use machines. In fact, it is possible to get pretty darn strong from certain machine based movements. It’s just that the response you get from heavy free weight deadlift, squats, and presses is much more robust than doing the same with a machine. Part of this is because most machines don’t provide the same level of resistance as free weight exercise. But another major part is the absence of stabilization and the un-natural mechanics that you get from a machine. However, when a certain muscle group is weak and limits the performance of a free weight exercise, machines can be a life saver. For example, a person with weak rear deltoids may find that their bench press strength is stalling out. Doing a movement like reverse pec dec flies or cable face pulls can build up the weak rear delts and help that person progress in their bench press once again. Machines can also be great for people who are starting out and want to build a base level of strength. Many free weight exercises require you to learn technique and can be awkward to perform at first. By comparison, machines are more user friendly and can be loaded up more heavily at the onset. During the time you are trying to perfect your form with free weight exercise, you can use machines to build strength in your muscles. Then, once you are ready to turn up the heat with free weight exercises, you’ll have a higher base level of strength to work with. When it comes to building up your musculature, both machines and free weights can be a good option. Because you can use heavier loads with free weights they are often a bit more efficient in this department. However, machines still provide a more than adequate dose as well. Additionally, many machines provide constant tension throughout the range of motion. With free weights, the tension decreases at certain parts of the lift which allows the muscles to take a break so to speak. 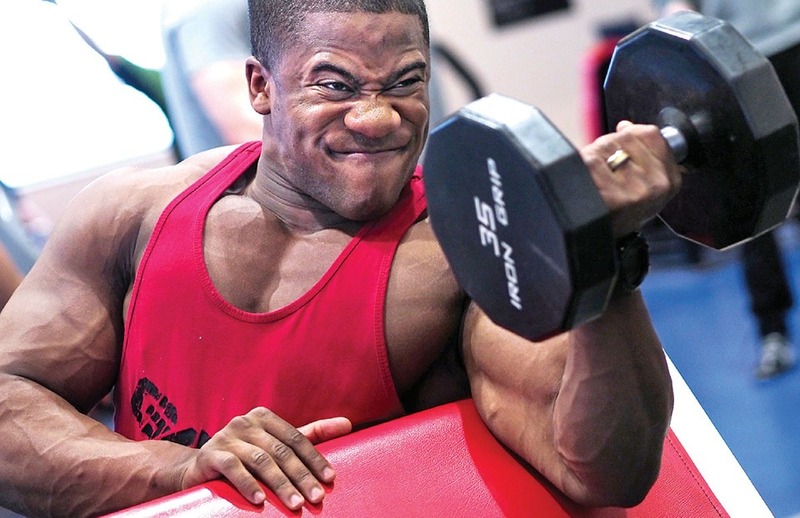 The constant tension from machine exercises creates more stress in the muscle which can lead to more muscle growth. The compound free weights exercises will target a lot of muscles at once while machines often target a single muscle. This is another reason why free weights are more efficient given that you get more bang for your buck. However, certain muscles may be harder to target for some people. Maybe you can’t perform pullups yet in which case a lat pulldown is a great alternative. In the end, if you are looking to maximize your muscle growth, then the best strategy is to include both free weights and machines. You can use the free weight exercises to really load up the muscles and then use machines to really finish them off individually. Perhaps you don’t care much about strength or muscle mass. Maybe you just care about which one will keep you in shape and healthy. We can look at this from a few different angles. First, having strength and muscle mass is actually a very healthy thing. Research now shows that higher levels of strength and muscle mass are health protective and decrease our risk of mortality (especially among the elderly). Given that this is the case, you want to make sure to include some free weight exercise from time to time. Second, bone mineral density is important for health, especially among those who are predisposed to osteoporosis. From this standpoint, machine exercise is not quite as good compared to free weights. The stimulus of bearing the load of free weight exercises is a great stimulus for increasing bone growth/density. You will get some of this depending on the type of machine you use, but not nearly to the same degree as free weights. Third, overall energy burn can impact our weight and body fat percentage which in turn affects many domains of health. Free weight exercises are often more taxing on the body and thus require more energy. However, using machines in a circuit style where little rest is had between exercises can also be very energy costly. In this case, free weights are probably still more energy costly but the difference isn’t huge. Again, using a combo of both may be the best option. The debate seems to roll on about whether free weights or machines are a better option for resistance training. In the end, it comes down to your personal preference and the goals you have in mind. If you are trying to win some lifting competitions, then free weights are a must. But even so, some machine based exercises can help you balance weak muscles and increase you overall strength. If your goal is to put on some muscle and be healthy, both free weight and machine exercises are helpful. Although free weights tend to be better overall even for health outcomes, machines can still provide a good stimulus in each domain. They are not useless as some training gurus and “experts” might tell you. So even though it may be a good idea to include both styles of training in your routine, you certainly don’t have to in order to see results. In the end, exercise is better than doing nothing when it comes to our mind, body, and soul.